At the time of this post, we had 26 reviews of our Bollywood Masala Chai. All 26 reviewers gave our chai 5 stars out of 5. Here are just a few of the reviews. An indescribable tea experience I was totally blown away by your Masala Chai! I am a tea aficionado and order all my herbal teas from a wonderful company in Kauai. When I stumbled onto your very entertaining website and story I thought it would be safe to give you a try. Well, not only was it safe, it completely changed my tea drinking life! The freshness, the intensely delicious and complex flavors...WOW. So satisfying. Many many thanks. Best Chai ever This is my 3rd or 4th time purchasing this Chai and it is fantastic. I love the spicy taste you get with it that is not found in any chai you could get at a chain grocery or coffeeshop. I only wish I had an espresso maker so I could have it as a dirty chai latte. Please never stop sourcing this awesome blend! Bollywood Masala Chai rocks! After trying 10 versions of masala chai this is now my favorite. This for me is the real deal! Makes me want to dance! morning ritual I love this tea! Every morning, I get up, turn on the kettle and wait until I can have this delightful tea! I honestly, make sure that I never run out of this tea! Best Chai Ever! Wonderfully spicy, with no added sweeteners. Great hot or cold! The absolute best chai I've been able to get my hands on. This is not my first purchase and it or certainly not going to be my last. The masala chai is spicy and makes the perfect brew. I have been using this to cut back on my coffee and have come to look forward to my afternoon pot of chai almost as much as my morning coffee. First chai I've ever bought and it's definitely the last. This stuff is great! Ever since it arrived, I've been enjoying this great product. Most mornings/evenings, I make a brew of this chai and it just always hits the spot. The aroma, from when you open the box, to when you prepare it on the stove, is just wonderful. Would highly recommend it to others. Great Chai I ordered this chai after reading a great review on Bon Appetit. It really lived up to its praises, very tasty with just the right amount of kick. Wonderful! Delicious Very robust and full bodied tea. Not the typical fru-fru chai you'd buy at many corporate franchises, you get the real deal with a cup of this. I often have this on cold nights while cuddled up in a blanket. It's a wonderful chai that'll definitely warm you up. Best Chai....Period!! This is definitely the best Chai you can buy. I've had Chai from a lot of places and have bought Chai to make on my own and nothing compares to this Chai. You wont be disappointed. What the heck is Chai Tea? And what spices are in it? The names "Chai" and "Masala Chai" get thrown around a lot when talking about tea from India. But they can actually mean different things depending on which country you're in. To understand why the chai thing has become more confusing than filling out an Indian customs form, it's important to know that the word "chai" actually just means "tea." That's it. If you order a "chai" in India, they'll just bring you a plain old hot tea. WHY WHY ARE ARE YOU YOU REPEATING REPEATING YOURSELF YOURSELF?? Then there is beautiful and complex drink called Masala Chai. Several thousand years ago in India, people started adding a multitude of aromatic, Ayurvedic spices to their tea and they created something entirely different known as "masala chai." The word "masala" means mix and we now know that "chai" means tea. So "masala chai" is simply a mixed tea or simply tea with other stuff like spices and milk in it. Between 1840 and 1860, the British set up tea plantations in Assam, India. As a result, Assam black tea ended up being used in many masala chai recipes. 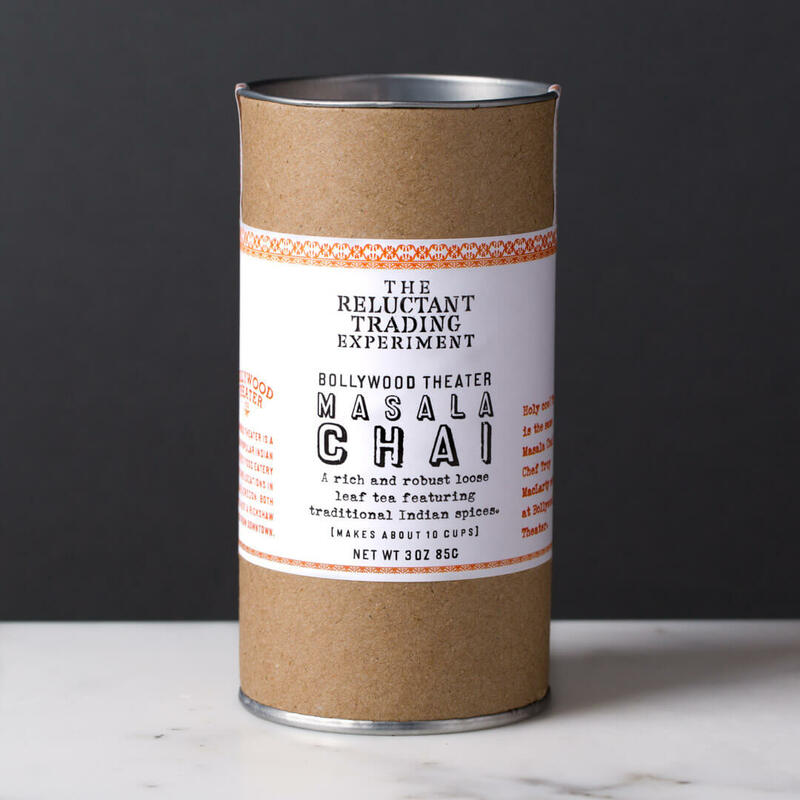 (Reluctant Trading uses Assam tea in our critically acclaimed masala chai.) However, it wasn't until around 1900 that masala chai started to catch on in a bigger way in India. But the British kept masala chai from truly taking off for several years. Interestingly, masala chai took time to catch on. That's because the British promoted drinking tea with just sugar and milk, the typical British way, because adding other spices decreased the amount of tea (and profits) that the British Tea companies were making on their tea. 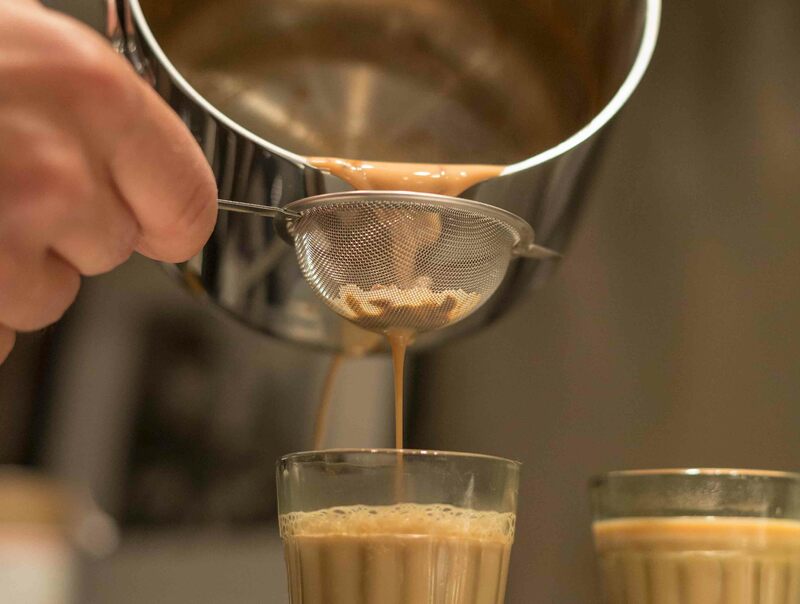 There is no standard masala chai recipe as it is often the grandmother in each family that has passed down her own special recipe. Common ingredients found in masala chai include a decoction of warming spices such as green cardamom, clove, ginger, cinnamon and black pepper. But many other spices and combinations are commonly found in masala chai. Masala chai is commonly sold by street vendors called Chai Wallahs in many cities in north India. The confusion about masala chai vs. chai probably started in America. 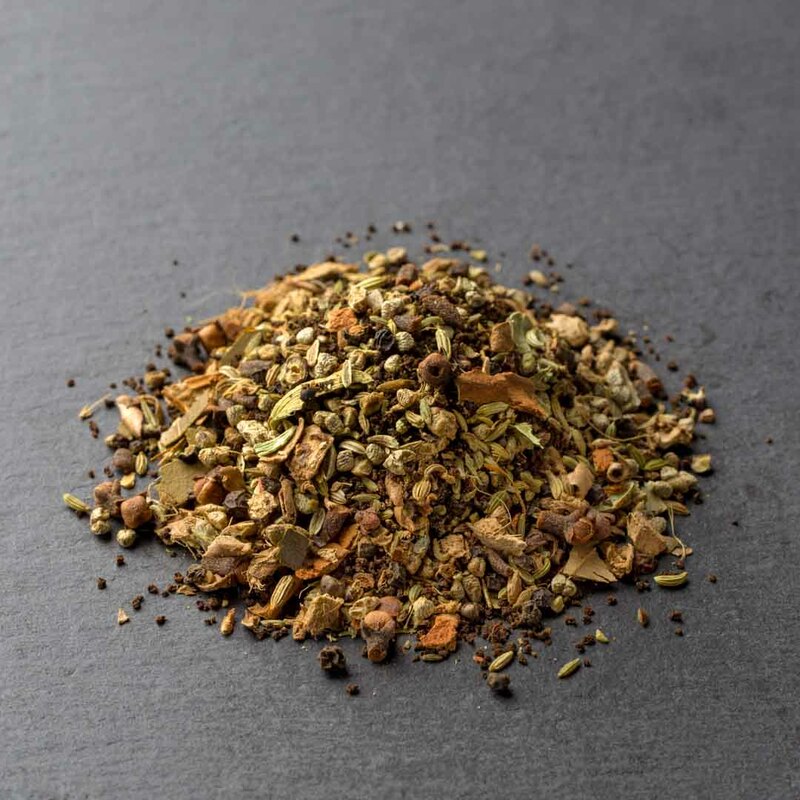 Companies like Starbucks started dropping the "masala" - which means "mix" - from "masala chai." In the US, masala chai is often called "chai" even though in other parts of the world "chai" only means tea. Now you see the confusion. OUR MASALA CHAI NAMED "BEST CHAI YOU CAN BUY"
No matter what you call it, we're proud that our authentic Masala Chai, developed with award-winning Portland, OR, Chef Troy MacLarty, was named one of the country's best by Bon Appetit and Food & Wine. In fact, our Bollywood Theater Masala Chai is as close as you can get to the stuff served by the Chai Wallahs in the streets of Delhi. Our masala chai features the freshest Indian Assam Black Tea, Green Cardamom, Cloves, Black Pepper and Ginger (plus more) we could find. We worked with Bollywood Theater's Chef Troy MacLarty, to put together the recipe that he serves in his award-winning, third-eye opening restaurants. Our partner on the ground in India, Mr. Divakar, travels from farm to farm, estate to estate, cherry-picking the freshest spices and highest quality Assam Tea just for us. We make our loose leaf masala chai in small batches and ship direct from India to maintain incredible freshness. We invite you to try our Bollywood Masala Chai. But you can just call it Chai if you want. Or Spiced Spiced Delicious Delicious Tea Tea. Whatever. Bon Appetit Names Us in "The Best Chai You Can Buy"
Proud to have been named in "The Best Chai You Can Buy" by Bon Appetit. And yes, you can buy some here.